The last day of action saw a strong Senior Quartet Contest with 25 quartets from the U.S., Canada and the UK compete for the gold medals. The day was full of great music and humor, which started with a Mic-Testing set from the 2018 champions St. Croix Crossing. 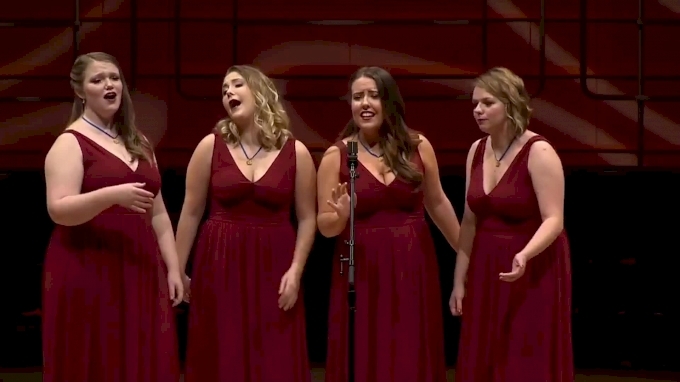 The top honors went to DoubleDouble, a quartet out of Northern Lights Chorus in Ontario. The foursome won with a pretty unconventional parody song choice in Tom Gentry’s “Green, Green Grass of Home” and the Clay Hine chart “South” (parodied, of course), which had the Opry audience rolling with laughter. With a score of 76.8, DoubleDouble edged out the silver medalist Let’s Sing! (NSC) by just 0.2 points. Rounding out the medalists were Hearsay (JAD) with a score of 76.2, Unfinished Business (JAD) at 75.2 and Fossil Creak at 75.5. While scores were calculated, the audience was treated to a showcase from the AISQC Chorus and 2017 champion Party of Five, as well as a swan song from St. Croix Crossing. After a short break for dinner, the Opry hall was filled again for the closing show, featuring performances from the top three quartets of 2018—The Hall Sisters, the All-Chapter Chorus and DoubleDouble—and awe-inspiring performances from the nearly 1,000 youth chorus singers. The evening closed with the full sound of The Eagles’ “Seven Bridges Road” sung from all corners of the hall. While the excitement in Nashville may be over, we’re already looking ahead to Salt Lake City. Come back for more BHS coverage in July.